The School of Panamerican Unrest is an artist-led, not-for -profit public art project initiated in 2003 that seeks to generate connections between the different regions of the Americas through discussions, performances, screenings, and short-term and long-term collaborations between organizations and individuals. Its main component was a nomadic forum or think-tank that will cross the hemisphere by land, from Anchorage, Alaska, to Ushuaia, Argentina, in Tierra del Fuego. This hybrid project included a collapsible and movable architectural structure in the form of a schoolhouse, as well as a video collection component. The project, which seeks to involve a wide range of audiences and engage them at different levels, offers alternative ways to understand the history, ideology, and lines of thought that have significantly impacted political, social and cultural events in the Americas. Initiated with the support of more than 40 organizations and more than 100 affiliated artists, curators, and cultural promoters in the Americas, The School of Panamerican Unrest responded to the need to support inter-regional communication amongst English, Spanish and Portuguese speaking America, as well as its other communities in the Caribbean and elsewhere, making connections outside its regular commercial and economic links. 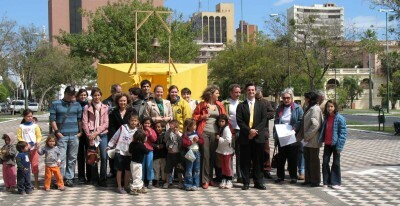 In contrast to Europe, which over the years has been orchestrating its cultural integration through an open flux of dialogue, many Latin American countries still have a limited cultural exchange amongst one another, and often limited to the connections offered by the hegemonic points such as New York, Miami, or even Madrid. Many years after the initial impulses by various Latin American intellectuals such as José Vasconcelos, Simón Bolívar, José Martí, who once envisioned a unified cultural region in the Americas, this project seeks to revisit and evaluate the meaning of those ideas during the time of the Internet and post-globalization. In the debates, programs and roundtable discussions, the project will seek to articulate and debate issues that pertain to local concerns around culture and society. We also seek to discuss ways through which artistic practice in the Americas can acquire an influential role in public life, political, cultural and social discourse, enriching their respective communities in a productive and proactive manner. The journey waas completed in September of 2006, and the documentation of it will be brought together in the form of a publication, a documentary and a traveling exhibition that started in 2008 and will be completed in 2011 at El Museo del Barrio, New York.